We are a powder coating company, based in Snetterton, Norfolk, that specialises in applying powder and wet paint coatings to a variety of substrates. First established in 2004, GKL Powder Coating is a small, responsive company with over 25 years' experience in the industry. We have built up a fantastic reputation in the trade, exulting in repeat business and offering customer service that is superlative. Specialising mostly in powder coating, GKL can provide services such as nylon coating, plastic coating, stove enamelling, wet spray and two pack finishes. We can coat mild steel, aluminium and stainless steel all in a wide variety of colours and finishes. Possessing a conveyor oven means we have the capability of doing batch work as well as being able to take up to 6.5m lengths in our two static ovens. Both high volume batch work and low volume standard work are welcome. 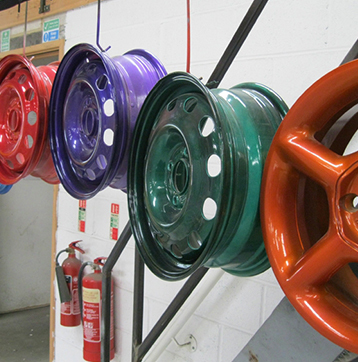 Our wheel refurbishment service holds a lot of interest and custom of which we are very proud. We are able to refurbish many other items too, such as bicycle frames, motorbike frames, and metal garden furniture. As we recognise that your time is valuable, GKL Powder Coating can facilitate collections and deliveries with its small fleet of vehicles. 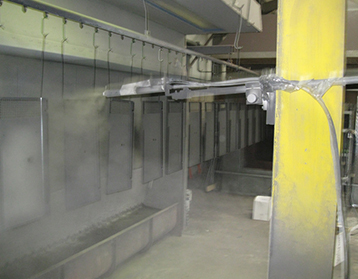 Our standard powder coating process normally takes 3-5 working days, however a 24 hour turnaround is often possible on request. If you have any queries regarding our service, are unsure if we can cover your job or would like a free quote, please do not hesitate to contact us either by phone, email or fax. Our opening times are 7:30am to 5:00pm Monday to Friday. © 2019 GKL Powder Coating All rights reserved.